The King of the Country calls upon his subjects to help give the town of FEUVILLE a new shine. The help of all the citizens is required and everyone does their share of the building work: the town mayor, the architect, the travelling entertainer and the publican. The friendly fairy and the grumpy gnome also join in. But beware of Dragomir, the dragon - if he wakes up, he will attack the town and burn everything not protected by the rain clouds to a cinder. Slip into the roles of the citizens of FEUVILLE and build up your own individual townscapes. 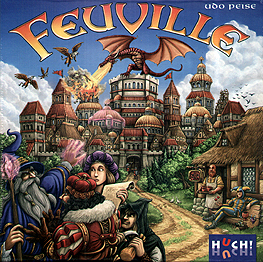 The player who collects the most glory points wins and becomes an honorary citizen of FEUVILLE!